There's been an increase in downy mildew affecting Impatiens plants recently. The particular mildew affecting impatiens is Plasmopara abducens. It spreads rapidly, under the right conditions, and once infected, there is no cure. However, there are some preventative measures you can take. But first, here's some background to help you understand the disease. There are 2 types of downy mildew spores. One type, zoospores, can be splashed up by water or spread by the wind. The other type, oospores, reside inside the plant tissue and can spread rapidly and over-winter. At this point, there is no evidence that this particular mildew affecting impatiens is doing that, but why take chances. Downy mildew is more prevalent in the spring and fall when the cool, wet or humid weather provides ideal conditions. Which Impatiens Varieties are Affected? Balsam Impatiens / Garden Balsam (I. balsam in a) These are taller plants than common Impatiens, with elongated, pointed leaves. Jewel Weed (I. capers is) and Yellow Jewel Weed (I. pallidum). Generally considered weeds, but if they are in the area, they can spread the disease to your landscape Impatiens. Himalayan balsam / policeman’s helmet (Impatiens glanduliferous), a wild and sometimes invasive species that can reach heights of 6 - 10 ft. (2 - 3 m), is tolerant of the disease but can act as a host. 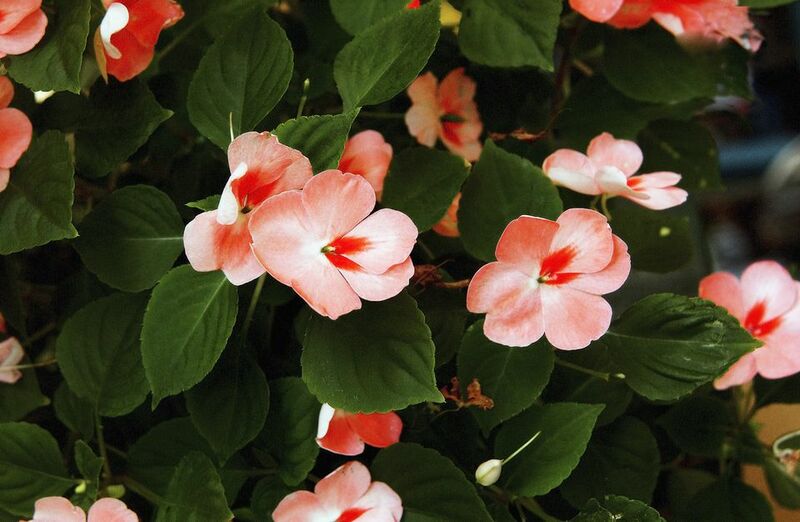 New Guinea impatiens (Impatiens hawkers) and its hybrids, like SunPatiens®, have so far shown resistance. There may be more plants affected or that act as hosts, but this is the information so far. Leaves stippled or chlorotic (yellowing) and looking like they need fertilizer. Floppy or downward curling leaves. As the disease progresses the plants may stop growing and look stunted, drop their leaves or completely collapse. What to do about downy mildew on impatiens. Although there is no cure for Impatiens already infected with downy mildew, there are some steps you can take keep it from spreading. Provide good air circulation. Don't overcrowd your plants. Water from below, trying not to wet the leaves when watering and water early in the day. Remove any suspect plants immediately. Will it Over-Winter and Re-infect Plants? So far, there is no sign that it infects seed, although other mildews do - so there is a chance. Some mildews can also over-winter in plant tissues. Although that does not seem to be happening with this downy mildew, don't take a chance by composting affected plants. If downy mildew becomes a major problem in your garden, you should consider not planting them for a year or two. Shade plant alternatives to impatiens include New Guinea impatiens, begonias, and coleus.